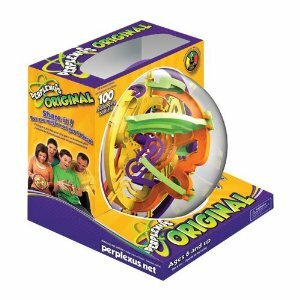 The Perplexus Maze Game is great fun for everyone in the family. We first discovered them in the Seattle Science Museum last year and it proved to be a great buy (we paid over $30 for it). So it is great to see this discount deal for just $20.99 with free shipping if you have Amazon Prime. Everyone who picks up the Perplexus Maze Game gets addicted to it pretty soon! You tilt the big ball so that you get the ball around the maze inside. It is great for all ages and it develops hand eye coordination in children. I think I missed out on this training in my early years because of course my 6 year old is much better at this than I am! It is good to find a toy for once that is fun, quiet, doesn’t need batteries and is educational all at the same time. If you are already hooked on the Perplexus Maze Game there is a more advanced version at Perplexus Epic . This one is $32 and in my opinion not as much fun as the original but if you are looking for even more of a challenge this could be the one for you. 504 Pampers ThickCare Baby Wipes just $9 Shipped!